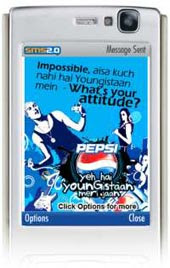 Pepsi has used a complete 360 degree marketing approach for youngistaan and the latest of the spectrum is mobile marketing. Afaqs is reporting on how MindShare Pepsi's agency handled the mobile marketing campaign . It used Mobile services like SMS 2.0 from Affle and SMSGupshup.com (a free SMS service from Webaroo Technologies) . According to agency the campaign also consisted of a mobile portal from which around 6,000 items, including ringtones, wallpapers and videos, have been downloaded and Youngistaan callerback ringtone were also being offered to users which got nearly 40,000 subcribers. The Pepsi Youngistaan campaign on SMS 2.0 was carried out in two phases. In the first phase, which was carried out from February to March, there was pure advertising. Young subscribers of SMS 2.0 were served a banner ad asking them to write in their views or attitude statements on Youngistaan, rate others’ views and check out Pepsi’s mobile portal. Views submitted on Youngistaan were shared with Pepsi, which were used to create new print ads for Youngistaan.” Around 600,000 impressions of the ad were served in four weeks, which received a CTR (click through rate) of 5 per cent. The second phase was carried out during April and May to coincide with the Indian Premier League tournament. Subscribers of SMS 2.0 who opted for cricket news were served IPL news alerts. Pepsi sponsored these news alerts by placing a banner ad which said ‘Pepsi refreshes IPL’ at the bottom of the alert. When a subscriber clicked on any such banner, he was directed to Pepsi’s mobile portal. Around two million impressions were served in four weeks; the CTR was 3 per cent.